The cagiest moment in Muppets Most Wanted comes during its opening number, “We’re Doing a Sequel,” when Kermit and co. allude to the fact that movie sequels are rarely as good as their original—the Swedish Chef’s Bergman-esque vision of what cinematic style this film should adopt is an early laugh-out-loud moment. In the case of The Muppets’ movies, it’s not a matter of comparative quality. The 2011 comeback film was lacquered with wistful nostalgia for the 1970s felt-covered vaudevillians. On the other hand, its follow-up is higher on the sort of self-aware satire that made the original Muppets television series so popular. The laughs, while hit or miss, are sufficiently sly to make this an enjoyable, knowing, star-studded romp. Literally picking up where the last film left off, the Muppets are barraged with offers to help capitalize on their rediscovered stardom. Chief among the pitchmen is Dominic (Ricky Gervais), a talent agent who proposes a Muppets world theater tour. As Dominic skillfully upstages Kermit as leader of the troupe, the Muppets are unaware that Dominic is in league with Constantine, “the world’s most dangerous frog” recently escaped from a Russian gulag. Constantine looks just like Kermit except for a facial mole that once covered by green makeup allows Constantine to assume Kermit’s identity. Moreover, he plans to use the Muppets’ tour as cover for the eventual heist of The Crown Jewels in England. Meanwhile, Kermit is apprehended and shipped back to the gulag, which is run by Nadya (Tina Fey), a stern taskmaster with a secret affinity for stage shows. The original songs span musical genres, from Broadway to disco to cabaret ditties. A number of Muppets sidelined in the last film enjoy expanded screentime this time around, notably Sam the Eagle (something else wryly noted at one point). And there are the cameos: some last a few minutes, like Salma Hayek, Céline Dion, and Christoph Waltz (a show host who dances, naturally, a waltz); some you’ll miss if you blink, like Sean Combs and James McAvoy as a UPS deliveryman. The thin storyline is propelled by a string of subplots, including Kermit’s task to train the gulag’s prisoners into a chorus line, and the investigation in Constantine’s crimes carried out by Sam and Jean Pierre Napoleon (Ty Burrell), a Clouseau-type detective used for a recurring gag about Europeans’ propensity for short workdays and extended holidays. And, of course, there’s ultimately (yet another) wedding planned between Kermit/Constantine and Miss Piggy. 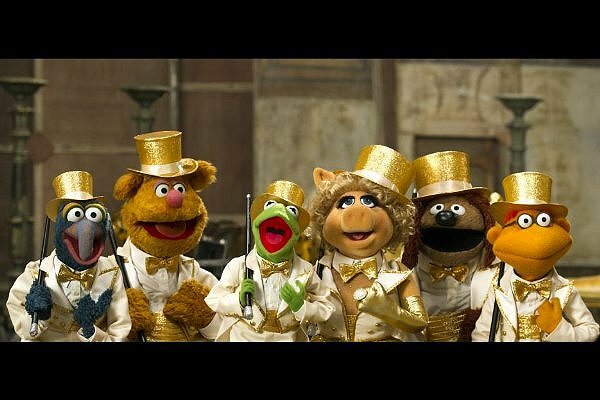 But the irreverent moments of Muppets Most Wanted are its best, including a moment where it reminds the audience that this is actually the eighth Muppets movie, a fact that smartly detracts and insulates it from the critical devotion bestowed upon the 2011 revival. This sequel isn’t designed to save a franchise—it’s just here to play the music, light the lights and raise the curtain on the Muppet show. It’ll make you laugh, and then you’ll forget about it an hour after it’s over. That’s entertainment.